Who doesn’t love to read? Books allow you to escape without stepping a foot outside your house. However, hours of reading can sometimes lead to a backache and other spine problems. If you are too engrossed with the thrill of the book that you stay in that position for a long time, you are most likely to experience sore muscles afterward. Hence, it is crucial that you invest in a reading pillow. A quality reading pillow will provide support to your back, spine, shoulders, and elbows. For all bookworms out there, make reading a more enjoyable experience. We have created a list of the top 10 best reading pillows that you can choose from! First on the list is the classic reading pillow from the Bedlounge. Thanks to its ergonomic design, you can extend the headrest for up to 12 inches, ideal for tall users. 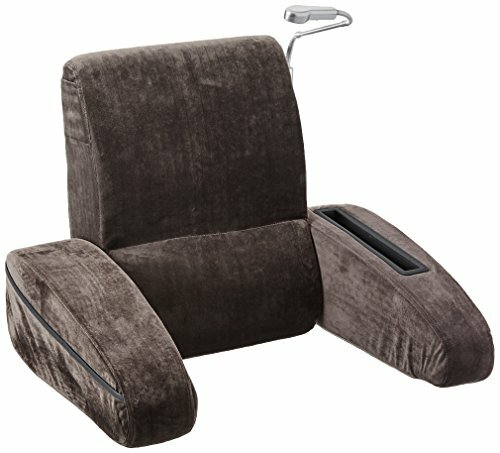 Even though this reading pillow features a headrest and armrests, you can still remove the cover for easy maintenance. The cover is made of 100% cotton, allowing you to maintain its natural color after several washes. 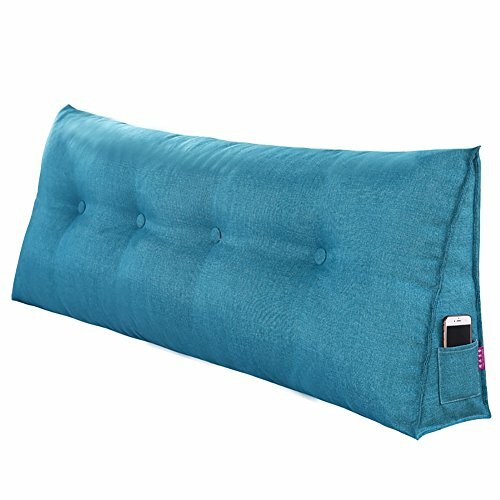 Despite its large size, this reading pillow is surprisingly lightweight in only 6.5 pounds, allowing you to transfer it from one place to another. The patented and durable inner frame of this reading pillow makes it great support for people with spine problems. Check out the Dulplay cotton reading pillow. This large triangular wedge cushion is perfect for reading novels the entire day. It’s soft and comfortable. 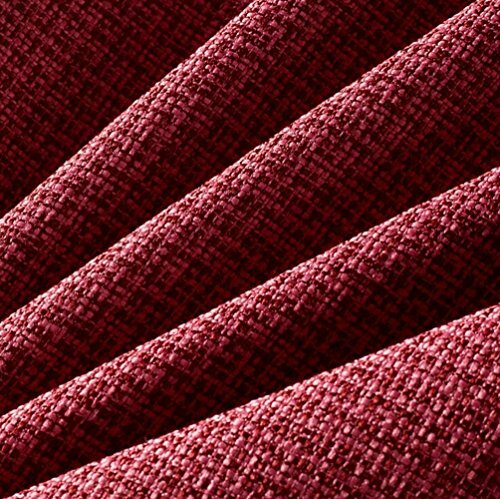 This product is made of high-quality fabric and good permeability. The cushion is filled with high-quality PP cotton. You can rest and read all day thanks to its good elasticity. You can remove the cover for easy cleaning later on. Furthermore, the triangular wedge cushion with buttons design makes the pillow look more full and comfy. It’s three-dimensional stronger compared to standard reading pillows and can be used in both beds and sofas. This pillow is an excellent choice for your home and office when you are reading. It’s also an ergonomic choice because it will help you to prevent spine problems in the long run that might burn a hole in your pocket. What we like the most about this pillow is its perfect curve that can be used in your waist to release the lumbar pressure. This pillow also absorbs intense pressure from your upper body when you are reading. Next, we have the Douh cozy large reading pillow. This pillow is intended for adult’s use due to its large size. Its flax linen cover is both elegant and durable. Rest assured that it will fit your modern living room or bedroom nicely. The triangular wedge pillow cushion is an excellent choice if you want to support your lumbar very well. It also helps in soothing muscle ache. The pocket on the end of this large and sturdy pillow allows you to place your remote control or cell phone while you are reading. You can also use this pillow as your headboard if you do not have one. 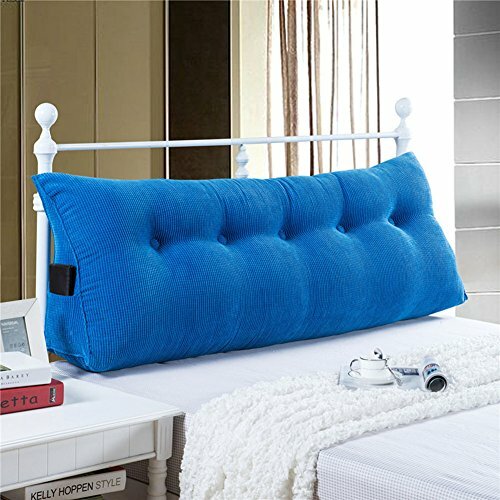 This comfortable and ergonomic pillow helps you to prevent various health conditions while you are reading on the bed. It’s also an ideal choice for office lounges. A zipper is located at the bottom of the back edge that allows you to remove the cover. This pillow is safe to wash in a washing machine. Tumble dry low, and it’s ready to use again. The VClife reading pillow is made of 100% polyester with durable flax linen as the cover. It is filled with pear cotton, soft and medium. It’s also hypoallergenic. There is a metal zipper closure that allows you to maintain the pillow clean without difficulty. This back cushion will not only provide comfort to your spine while you are reading but it’s also a fantastic home decoration in your house. Aside from that, you can choose from colors beige, gray, linen, wine red, orange, and sky blue to perfectly suit your existing interior design. We like the large size of this pillow that allows adults to enjoy it as well. It’s firm and sturdy that can release the lumbar pressure while you are reading or doing something on your laptop. This pillow is both stylish and comfortable. Rest assured that it will fit any modern living room elegantly. Now you can reduce strained muscles when you’re reading! We’ve included the Vercart reading pillow because of its high quality and great design. This reading pillow features a corduroy cover compared to other items that we’ve reviewed. The king-sized pillow can support both adult and children reading books in the living room or bedroom. There is a zipper closer on the edge of the cover that makes the cover removable. The cover is safe to wash for easy maintenance. Now you can enjoy this soft and comfortable pillow when reading your favorite book. Its high-quality fabric and good permeability is an indication that this pillow can last for a long time. If you are looking for the ideal reading pillow for home or office use, this might be the perfect solution for you. It’s firm enough to release the pressure in your lumbar and avoid spine problems in the long run. There is a slide pocket located at the edge of the pillow that allows you to place your phone and other small gadgets. This elegant-looking reading pillow from VClife is the perfect solution for adults who spend most of their days reading inside the house. The cover material of this pillow is cotton, making it more comfortable. Its fillings are PP cotton, and with its large size, it can also act as your bed’s headboard. 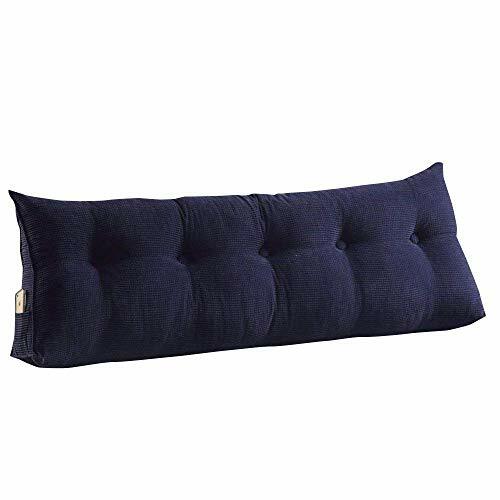 The detachable cover with zipper closure allows you to clean the pillow without difficulty. We like that it has a breathable fabric to prevent odor and body sweat from getting trapped when you use the pillow for too long. Modern or rustic living room, this pillow will complement your interior home design. It can also help you to prevent spine problems in the long run. It’s also an excellent choice if you prefer doing the rest of your work in the bed, making it more comfortable and easing you from pressure. Built to last, this reading pillow can serve you for years to come. If you are looking for a reading pillow with armrest, you should check out the Brookstone eComfort bed red reading pillow. This pillow is superior in quality. With its sturdy construction, it can last for a long time along with proper use and maintenance. You can use this pillow for reading, relaxing, and using your computer. It’s also an ideal choice if you are looking for a comfortable pillow that you can place in your office thanks to its elegant design. Also, the armrest allows you to relax your arms while you are reading. It provides support not just in your back but your elbows as well, easing the pressure from your entire body. It comes with an attached lampshade at the edge to give you proper lighting when you are reading or using your laptop. For hard workers who spend most of their time inside their office, this pillow is an ergonomic choice for you. 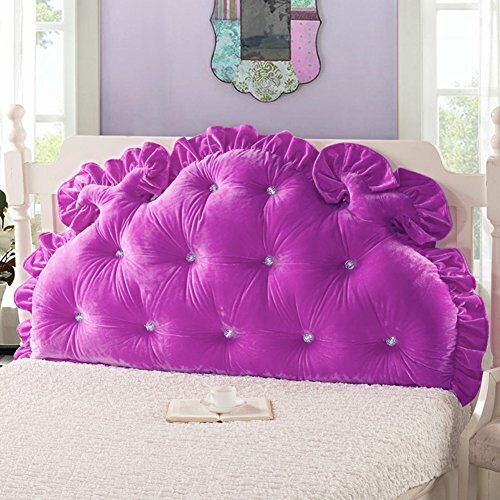 Treat yourself like royalty with this luxurious reading pillow from YZCSell. The cover is made of velvet, making it more soft and comfortable. This reading pillow is filled with high-quality PP cotton and provides good elasticity for late night readings and work. Its durable construction can assure you that this pillow will last for a long time. You can use it in your bed or your sofa, whichever you like and it will transform your room into a place for royalty with its elegant design. Also, you can use this reading pillow on your waist that effectively releases the lumbar pressure from your body. This is not only stylish but also functional. We like its perfect curve that hugs your body accordingly making it more comfortable to lean on. It’s a great gift for working adults because of its large size and comfortable fit. Now you can avoid spine problems with style! 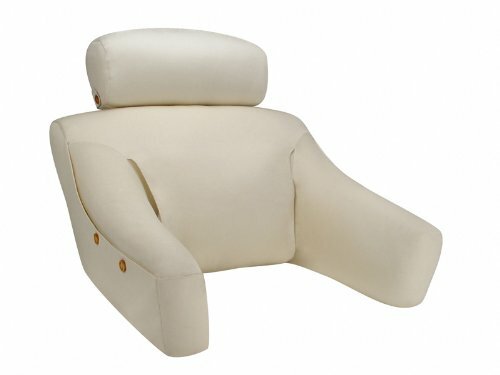 Another product from Bedlounge is this hypoallergenic reading pillow with armrests. It’s ergonomically designed that contours your body’s shape. You can adjust the headrest for up to 12 inches. This reading pillow is recommended for people 5’3 and above. Also, the hypoallergenic fill makes this reading pillow lightweight and portable despite its large size. 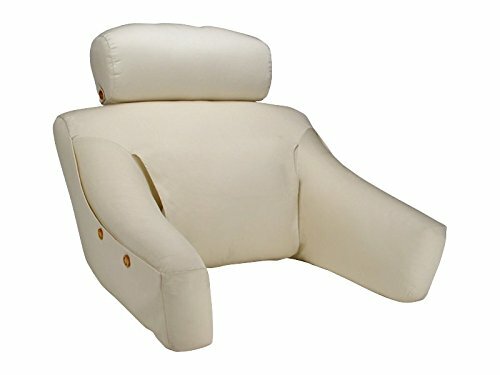 Unlike the previous product we have reviewed with armrests, you can remove the cover of this reading pillow for easy maintenance. The cover is safe to wash in a washing machine. Since it’s 100% cotton, you can maintain its natural color even after multiple washes. Its patented and durable inner frame supports your back accordingly. Lastly, we have the YXCsell reading cushion with a cover that’s made of canvas. You can detach the cover in ease, allowing you to wash it when necessary. It’s ultra-soft, and breathable fabric also ensures that body sweat and odor are not trapped in the pillow when you use it for continuous long time. We also like its ergonomic curve that hugs your waist correctly to release the lumbar pressure when you’re reading or using your laptop. It’s a great home decoration that allows you to avoid spine problems in the long run. This pillow also makes it easier for you to sleep. 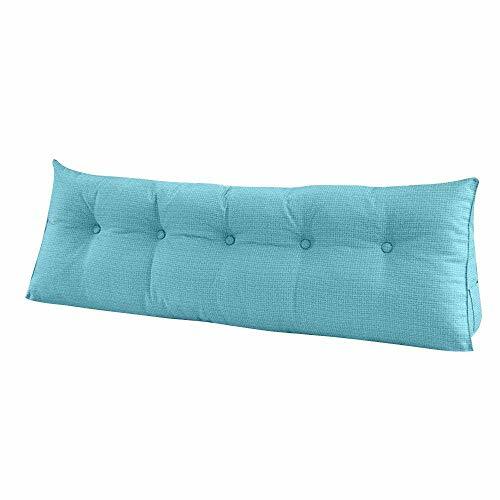 You can use it as a headboard, and because of its large size, adults can also use this pillow. Sleep or read in comfort with this reading pillow and rest assured that you will have a cozier living room or bedroom.